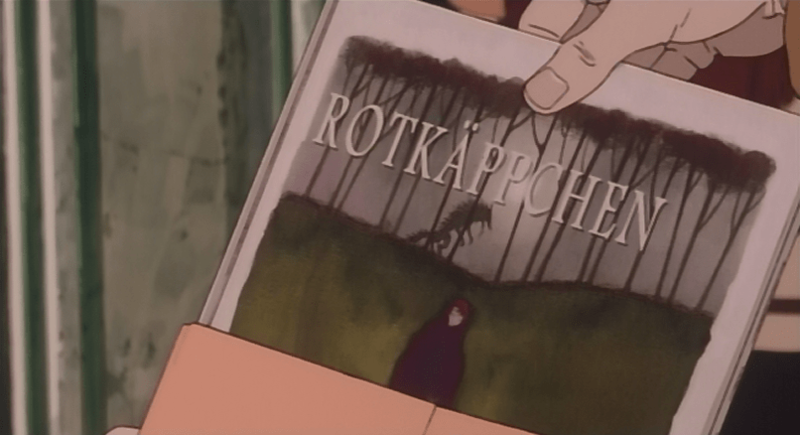 Jin-Roh: The Wolf Brigade is a 1999 theatrical film from Production I.G and directed by Hiroyuki Okiura. The story, written by Mamoru Oshii, is an adaptation of a portion of his Kerberos Saga that he first began in the 1980s. As a whole, the Kerberos Saga spans a variety of media including manga, radio dramas, and live action in addition to animation. 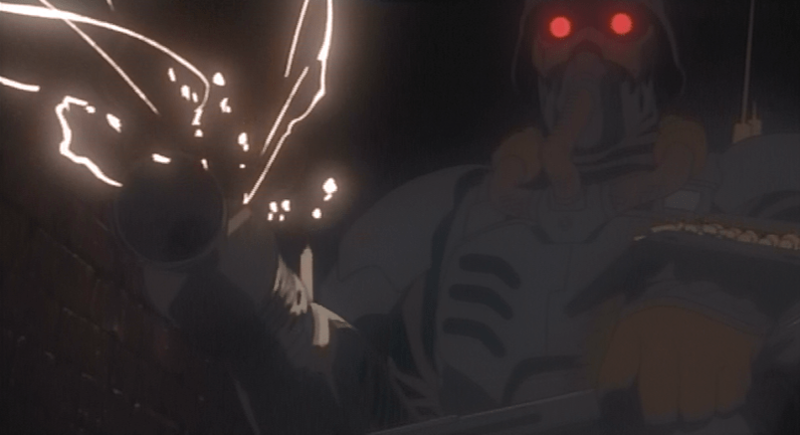 But despite this connection, Jin-Roh is a standalone tale that requires no background knowledge save that which the film provides on its own. 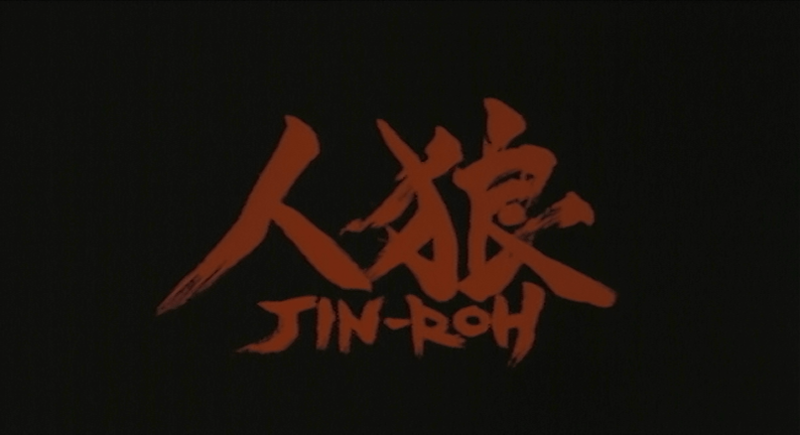 Jin-Roh is set in an alternate vision of Tokyo of the 1950s in which Nazi Germany has conquered Japan. To safeguard the government against insurrection, the Capital Police was established specifically to serve as a means to counter anti-government organizations. A division of the Capital Police called the Special Unit serves as their heaviest hitters; men dressed in all-concealing, metal armor with respirator masks and infrared goggles and armed with powerful, belt-fed machine guns. Though not named such in the movie, these soldiers are also known as Panzer Cops. It is among the Special Unit’s ranks that the protagonist, Constable Kazuki Fuse, is introduced. In the opening minutes of the film, he and other members of the Special Unit are in pursuit of resistance fighters in the sewers underneath Tokyo when he comes across a Red Riding Hood; a teenage girl working for the resistance as a courier. Cornered, the girl threatens to pull the cord on the satchel charge she’s carrying. But rather than shoot, Fuse is only able to ask her “Why?” His hesitation proves devastating, as the girl pulls the cord, blowing herself up and causing significant damage to both the city and to the reputation of the Capital Police. Protected from the blast by his armor, Fuse is punished by being sent back to the academy for more training. He’s used as a scapegoat for the blunder, bringing embarrassment to the Capital Police for the appeasement of Tokyo’s separate, local police force. But as Fuse is sent packing, rumors spread of a mysterious “wolf brigade” within the Capital Police. The identities of its members and the brigade’s purpose are unclear; what is clear, however, is that the Special Unit has made numerous enemies, both in the Public Security division of the Capital Police and in Tokyo’s local police force. As Fuse spends his days participating in training exercises and combat drills, he remains haunted by the death of the girl in the sewer, and with help from a friend is able to locate her grave. 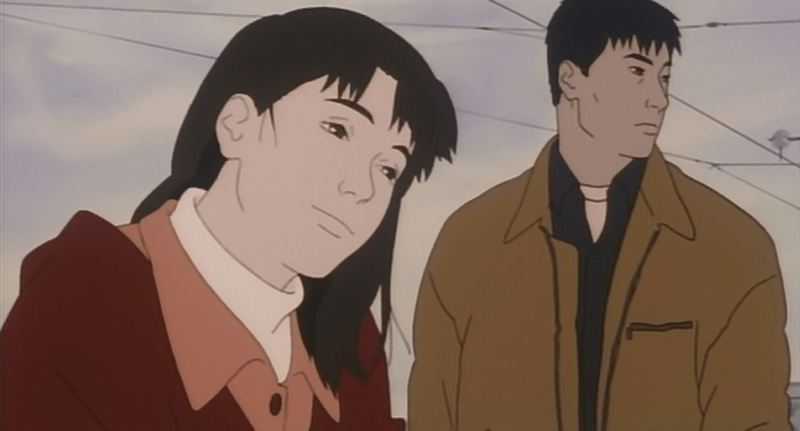 There, he meets Kei, a young woman that introduces herself as the deceased’s sister. Trapped at the academy until further notice, Fuse finds respite in being with Kei, who despite her sister’s death is openly accepting of him; she tells him that she can’t be angry because both he and her sister were just doing their jobs. As they get to know each other, she gives him a gift: a copy of Little Red Riding Hood. Kei and Fuse share a quiet moment together. 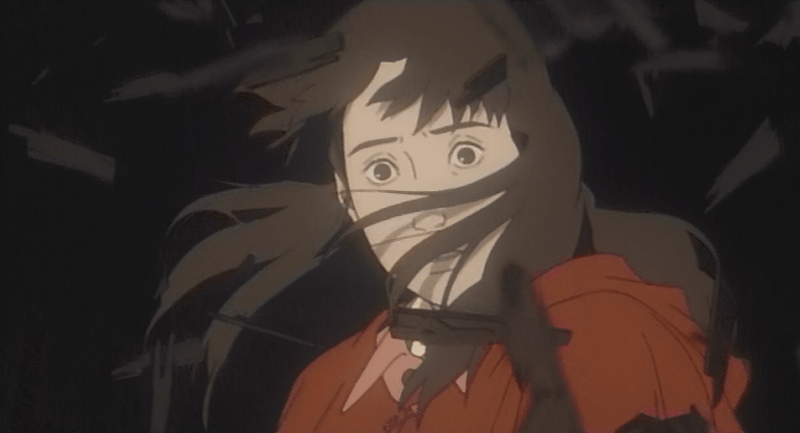 If it’s not clear by now from previous mentions of Red Riding Hood and wolves, the old fairytale is thematically entrenched in Jin-Roh’s story, though the interpretation of the tale told is far more gruesome than that told by the Brothers Grimm. Passages are narrated at points, at first mentioning how Red Riding Hood is forced to wear iron clothes that she’s required to tear before she could see her mother. Once this is done, she’s given a basket of food, and she makes her way to the woods. There, she encounters the wolf, which then takes the alternate path to the mother’s house and eats her. When Red Riding Hood finally arrives, not only is she taken in by the deception of the wolf’s appearance, with those big eyes, ears, claws, and teeth, but is tricked into consuming the leftover flesh and blood of her own mother. Probably not the version you’re familiar with. The gruesome nature of this story is reflected in Fuse’s dreams. A man suffering from PTSD, he dreams of the girl that killed herself before him and sees her turn into Kei. Flanked by a pack of wolves, he pursues her, not wishing to come to harm, but to his horror, the wolves catch her and tear her apart. Fuse himself is the wolf in the larger Red Riding Hood tale of Jin-Roh; one of many that guard Tokyo with deadly force. Yet he is a wolf that wishes to protect Red Riding Hood rather than eat her. His training begins to suffer as visions of Kei cause him to hesitate. In the world outside Fuse’s nightmares and desires, the enemies of the Special Unit have painted a bulls-eye on him. Already cast as a scapegoat for the botching of one operation, they wish to frame him in such a way that the resulting scandal would force the Special Unit to disintegrate. And for that, they have their Red Riding Hood; Kei, whose mission all along has to get close to the wolf and lure him into their trap. But Fuse has played a trick on both Kei and his enemies all along. He is a member of the rumored Jin-Roh; a wolf whose secret mission is to protect the Special Unit from outside threats. And the film’s third act sees him accomplish this goal with aplomb, pulling Kei out of her role as bait before returning to hunt down those that threaten him and his “pack”. These final bursts of violence reveal how terrifying the Special Unit is and why even those in other divisions of the Capital Police want them disbanded. Alone, in full armor, Fuse is like a relentless, emotionless monster, fully capable of killing and incapable of being killed. The effectiveness of this conclusion is predicated on the fact that the key plot point, Fuse’s membership in Jin-Roh, is kept a secret from the viewer until near the end. In a way, it feels like a cheap narrative trick. It’s an important fact about the protagonist, a man whom we’ve identified with throughout the story, which is deliberately kept out of view until the last possible moment. And yet, it feels natural given the number of other characters, including Kei, that mask their true intentions from Fuse. With that narrative trick in mind, the story is still one that is well-written. Oshii’s vision of an alternate Tokyo is well-realized in both its script and the way it’s brought to life. 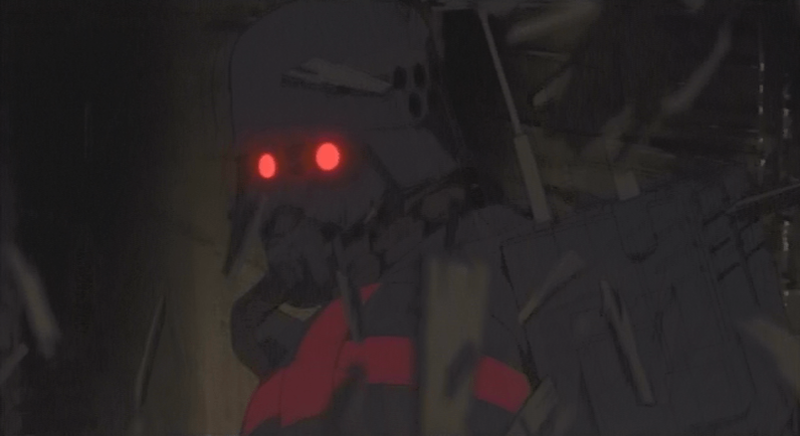 Jin-Roh’s color palette is muted and faded, giving everything a worn, subdued look. Fuse, Kei, and the other characters are interesting, both in their designs and their demeanors, bringing a strong emotional quality to a story that is at times heavy-handed in its allusions to Little Red Riding Hood. And at the base level, the script demonstrates remarkable restraint on the part of Oshii, who in later years has given himself more and more to using his films as stages for philosophic debate (See Ghost in the Shell 2: Innocence as a particularly dreary, painful example of this). Ultimately, Jin-Roh rises above its fairytale inspirations and tells a very mature story of a man’s struggles, both internal and external. When prodded, Fuse the wolf is able to bring an end to the conspiracy against the Special Unit and frees Kei from the control of the enemy. But lest you think this film ends happily, it’s best to remember what happens at the end of Little Red Riding Hood. And not every version of the tale has a heroic woodcutter. 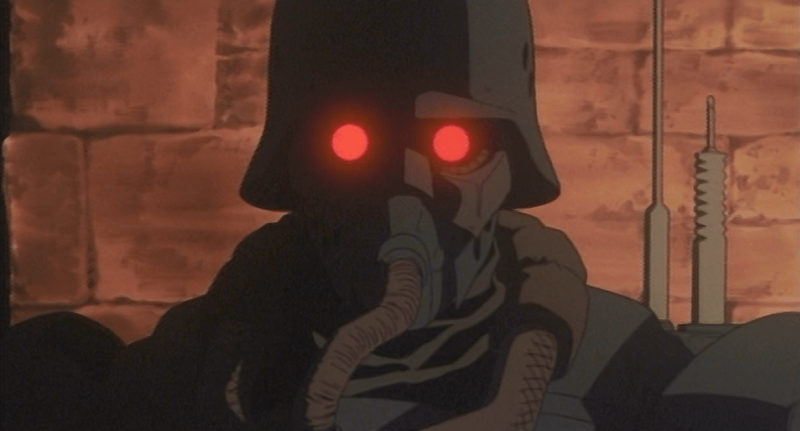 Jin-Roh: The Wolf Brigade was released on DVD in North America by Bandai Entertainment in conjunction with Viz Video and on Blu-ray by Bandai under the company’s Honneamise label. The release features the original Japanese audio with English subtitles and an English dub. The film is not rated, but is suggested for ages 16+ by the publisher for graphic violence.